A few months back when it was still hot outside , a friend made me realize that I have almost nothing in white in my wardrobe. And I love white ! Whaaatt !! So I had been wearing a lot of white in the summer and recently too, and absolutely loving it. Like the one you saw here. This dress I’m wearing today was a gift from a friend and I love how simple it is and yet so chic. It is actually not a dress, but a playsuit/romper. It has a front layer that makes it look like a dress. Fun fact – I have a little phobia, I get a little scared of wearing rompers/jumpsuits I sometimes feel I’ll be stuck in them forever. Does that happen to you too or it’s just me who is weird? With such pristine white outfits I feel like I’m spoiling it by adding any jewelry to it. So I kept it simple with gold studs and blush colored flats. 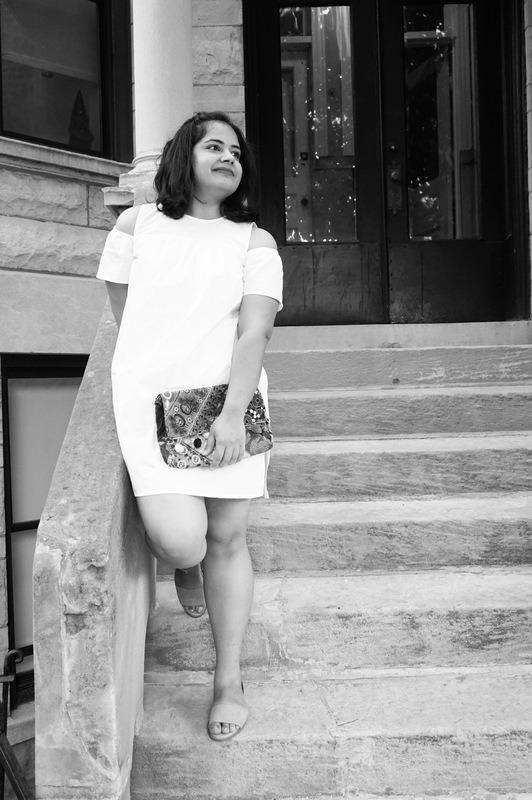 And I brought along my ethnic clutch to add a beautiful pop of color to the outfit. It just makes everything stand out. I loved it. I styled my (short crazy) hair with a braid to compliment the charm of the dress. I hope you enjoyed the post and stay tuned for more. And do share how you wear your white outfits ! < Previous Confidence – my key to freedom | Happy 2017 ! !